Well - a lots happened in the last 3 months. Baby Erin's arrived and is causing the buns all manner of earache! Magic had a return of the Clear Gel like poo but it was easily cleared up with more fibre (Hay! ).They are both on minimal pellets now. Magic's just been for her boosters so she is now covered for VHD and Myxi. There have been a number of cases of Myxi in the North West so I feel happier that she is now covered. Especially as it can be transmitted by foot, and with all the visitors to see Erin - Myxi could have quite easily made it into our house. They've both had a shipment of wicker balls and hoops from Bunnymail - I also bought them a brand new large CHUBE to play/hide in. The last was was shredded to within an inch of its life. Anyway - today i'm bringing the website up to date. Handmade cards will be available via Ebay in the next couple of weeks. Keep in touch and let me know how the buns are doing! Noticed a very strange clear gel like mass in the cage yesterday. Not sure which bun it had come from. Rang the vet and explained what I had seen, and the bun's behaviour and eating habits. They were eating and drinking but we'd noticed the food wasn't disappearing as rapidly. He asked if there were solid poo's around and there were, and whether we'd given them something new to eat - which we hadn't. He suggested probiotic powder to be added to the drinking water, Avipro. Ian suggested this be the first course of action. If the mess increases or their behaviour deteriorates then he'd need to see the rabbits. I had previously explained that at 38 weeks pregnant catching and bringing the buns into the surgery would be difficult! I added this to the water, but an hour later I came back into the kitchen and Magic had had quite a few "accidents". She seemed OK - still bouncy but run's bothered me. Whilst I was cleaning up though I noticed that she was eating and drinking, so we agreed that we'd see how see was overnight. Judging from the racket they were both making they were in high spirits and had trashed most of their toys during the night. Solid poo's were also seen in the cage. The course of Avipro is for 2 weeks so we'll keep an eye on them and keep them on the Avipro. The key is that they were still eating and drinking. The frequency of my updates isn't getting any better is it! Sorry! I'm now on maternity leave, baby's due July 1st so I'm trying to get as much rest in as possible. We have finally removed the need for vet bed in the dog cage! The problem we were facing was that the dog cage has wire like sides and therefore lots of gaps. Also the vet bed required machine washing really to get the wee out. (The buns are house trained in so far that they'll only poop and wee in the dog cage!). I didn't want to wash my new baby clothes in the same washing machine as the vet beds. Also, the cage having wire sides meant that with a good aim, the buns would also wee on the floor and we didn't want the floor to get stained. So, how have we mastered the issues? Well, we bought a plastic sheet from B&Q for £11 and basically made a liner for the inside of the dog cage. The sides come up about 5 inches, with a lip at the front to stop too much spillage of litter and hay. The liner is sealed with sealant from the outside. So now we just use wood litter and hay in the cage. We should have done it long ago. There's no odour, cleaning is really easy, there's less hay over the floor and we have loads of compost material. The buns are comfy and love all the hay around them. It does mean that the liner cannot be removed without actually breaking the seals - but there's no need to remove the liner as the inside is totally accessible and leak proof. Both buns are fine. I'm bringing Magic's Myxi jab forward as we've had a breakout of Myxi in nearby Prestwich and I've started to see lots of wild rabbits near our estate. Better safe than sorry. Will ring the vet this week to discuss! How ashamed - has it been that long since I wrote? Oh dear! In that time we've been on a break to the Lakes, to get some rest before the baby is born in July. Rodney and Magic went to stay with Karen. They enjoyed it and certainly kept Karen on her toes! Rodney seems to have returned more clingy to Magic and they seem to cram into the litter tray together for a snuggle all the time! We're still no where near finishing off the garden so the buns haven't been able to explore outside - however they have been snooping round the house as per usual. Rodney has selected a particular corner near the bedroom door that he likes to dig at so we've installed a carpet mat over the top (cheap, from B&Q) which he rips to shreds and ignores the carpet underneath! I'm struggling to clean the buns out now, its the bending! So I've been getting help with the bunny housekeeping, all that poo etc is good training for whats to come! Well, Rodney has now had both boosters (VHD and Myxi). I recall the Vet saying Rodney maybe subdued after his VHD. No such luck - he was a hyperactive bunny all afternoon! Both Rodney and Magic are well. Magic is increasing in confidence around the house and is exploring more of the house on her own. I'm currently trying to find alternative bedding for the cage - or a radical new approach to their home. You see at the moment, although litter trained, they do mess up the vetbed sheet in their cage. Which I have always washed in the washing machine, with a good rinse afterwards before we use it. However with the baby coming I'm nervous about continuing with this. Anyone any ideas? Should I just resort to newspaper in the bottom of the cage instead? Everything went fine at the new vets. Ian gave both Rodney and Magic a good check-up (teeth, stomach, bottom etc.). Ian asked a very good question that I'd not followed up before with my previous vet. Ian asked whether I'd noticed any creamy white urine in the cage. I had, but only occasionally. Ian explained that this is due to the high calcium content in premium pellets such as Excel. Excess calcium cannot be retained by bunnies and is therefore passed away, however if this is persistant there is a risk of the bunny becoming calcium deficient. The solution is purely to reduce the amount of pellets the buns are given and concentrate more on Hay and Greens. Pellets provide a good inital source of nutrients but in this case even half a bowl full between Magic and Rodney could be too much. So, they still get their Excel Lite breakfast, just not as much! Rodney had his VHD booster and is going back for his Myxi in two weeks time. Finally organised a vet for Rodney and Magic. After ringing round the local vets in the area and asking about their: Experience of Rabbits; Prices; Parking; and Saturday Appointments I settled on Pennine Vets in Tottington, Bury, for Rodney's boosters and check up for Magic. As I haven't been and I've had no recommendations for local vets I am taking a risk but I felt comfortable talking to their Reception. I'll fill you in on the details after his jab on Saturday. One vet was charging £24 for a Myxi jab - surely thats scandalous! Pennine seemed much more reasonably priced. Rodney and Magic are fine. Rodney's got that glint in his eyes again - Spring must be on the way. He was pestering Magic this morning - but he's not tried anything on tonight! Rodney and Magic have been out and about in the house. Rodney took to digging at one particular corner of carpet in a doorway. I went to B&Q and bought a carpet mat, the closest match to our carpet, and placed it in the doorway. Works really well, apart from when Rodney digs at it, he pulls it up, but he thinks he's getting somewhere so he leans too far back and falls over! He then swans off as if he meant to do it - ego somewhat dinted! Bless! Hope all two and four foots are keeping warm! The bump is growing! Nearly 6 months now! Magic has now ventured into the rest of the house. Her determination not to get out the litter tray when I tried to clean them out resulted in her and the litter tray being relocated in the hallway! With excellent results. I think because Rodney came out with her and showed her around she was more comfortable. She really got stuck in and the binkying was almost olympic standard! She's not ventured out again since but I think there's too much going on in the rest of the house. But Rodney is waiting by the door now as soon as he hears someone come downstairs! The chinchillas are gorgeous and I think I'll miss them when they've gone. They are two little characters! Granted, they don't move around alot but they are nocturnal. Give them a fruit stick and they are party animals! My living room chairs now have a fine layer of white sand on them as they have been enjoying their sand baths! No, I won't be adding Chinchillas to the house on a permanent basis. 2 bunnies and a baby on the way will surfice! Rodney is now the intrepid explorer. After weeks of leaving the kitchen door open, after bunnyproofing everywhere, whilst I was cleaning their cage out I placed the Litter Tray in the doorway of the kitchen (with Magic still in it because she wouldn't budge). Magic just sat in the Litter tray looking at the "outside world" whilst Rodney chinned the Litter Tray and went off exploring! He'd go on a little trip, come back to the litter tray, chin it, and off he'd go again. He's now fully aware of the stairs and hallway and is keen to escape the kitchen whenever the door is open. Magic however is less keen and hasn't been out again since. I think she appreciates the peace and quiet she gets whilst he's away, recently due to the new surroundings Rodney has been reinforcing his dominance and did become quite a pest to poor Magic. Now because of the exploring she gets some peace and he's too knackered when he comes back! We're looking after my friends Chinchillas for a week. Colin and Gizmo (Gizzy). They are gorgeous! As they are only staying a week and I don't fancy trying to catch a chinchilla in my current condition, they are staying in their large cage until they go home. At the moment I think they are just grumpy because of the move, but after some raisins they seems happier to run around the cage! So, we definitely feel more settled. Seeing Rodney running about on the stairs really did make it seem like home. The Builders have been in fixing bits and pieces and commenting "Funny looking cats!". I don't think the concept of Houserabbits is that well known round here. Myt next quest is to get a Vet. Rodney's due for his booster. I've found a website for one nearby. I just have to ring them this week. I rang the RWA for any recommendations and I have to say that all the ones they gave me were a small trek away and I really would prefer somewhere more local if I can. I'll keep you posted how I get on. I've been ill with the flu thats been going round. Not helped by builders coming and going either - had a check up with the midwife just to be on the safe side and bab's heartbeat was pumping away nice and loud! Wow! What a year it's been. It wasn't until I started archiving last years diary that I realised how much had happened. Sad to think that this time last year I was overjoyed because Rodney and Lou Lou has finally bonded. It does seem so long ago. Anyway, to bring you up to date. Rodney and Magic went to live at Aunty Karen's until after we had moved house. Once the flooring on the ground floor had been fitted and the furniture moved in we were able to bring the bunnies back to the house. This was their first Motorway journey. I ept plenty of hay in the travel box, but Magic wouldn't settle and gathered up all the Vet Bed at one end of the carrier. This meant careful driving round corners as Rodney only had a slippery carriet bottom to stand on. Neither were stressed out when they arrived at the their new home. To start with I had setup the smaller Ferplast cage to keep them in temporarily in the Kitchen. This was so they could get used to the sounds and smells, but also to give me time to sort out the bunny proofing. The kitchen will always be their base and ultimately I aimed for them to be in their old dog cage just roaming free in the kitchen when we were not around, then allowing them the run of the ground floor when we were able to supervise. The kitchen needed all "gaps" bunny proofing and the installation of White Plastic Angle Beading on all skirting boards and up the external corners of the wall. The Angle Beading was secured to the skirting board using one small panel pin at either end, hammered into the Skirting. We would recommend drilling the tiniest of pilot holes first in the Angle Beading to make sure it doesn't shatter/splinter. It looks great, fits in well with the skirting. The beading I put on the external corners of the wall was to protect the plaster. This was secured with Blu Tac! 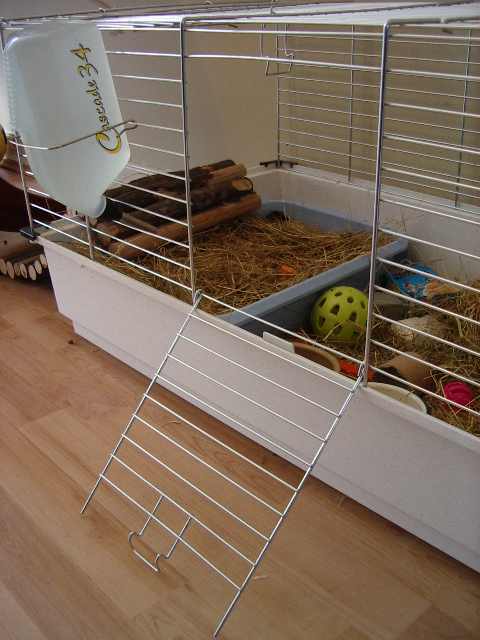 The next stage, once all this bunny proofing was in place was to move them from the cage to the Dog Cage. This was nerve racking only from the point of view of whether they would remember their litter training. We needn't of worried! Not a problem. Magic took a while to get used to the Karndean Flooring (compacted vinyl tile) but is fine now. Rodney is still exhibiting displays of dominance by mounting Magic but this is reducing in frequency. It is now up to me to get my skates on and install the Angle Beading on all of the skirting on the ground floor, and install a baby gate on the stairs to prevent them going upstairs. Another reason for having the baby gate is that I can now announce that I'm 4 months pregnant! So any tips on bonding baby and bunnies would be greatly received! So I think that brings us up to date. If anyone can recommend a good Rabbit Vet in Bury/Ramsbottom I would appreciate it as Rodney's due for his boosters next month. Keep safe in the wind - make sure your outside hutches are secure. If the noise, for inside bunnies, is an issue try leaving the radio on for them to distract them and act as a source of constant noise in the background!